Gas prices across the United States continued to relax during the past week, this following a month-long price surge that peaked in the days immediately surrounding the Thanksgiving holiday. The average price of a gallon of regular unleaded gas, at the national level, is now $3.24, although drivers in some regions are enjoying $3.00 gas. The lowest official price, according to the weekly gas price survey from the Energy Information Administration, is $3.05, along the Gulf Coast. Prices in the New England states and across the Central Atlantic actually rose by about a penny per gallon, according to this week’s EIA report. Prices in California and across the broader West Coast region were primarily flat, although some price declines were seen in scattered areas. The biggest price drops, during the past week, were in the Midwest and Gulf Coast, where prices were down by over 5¢ in each region. For truckers, the news about this week’s diesel prices is more tempered. Diesel prices across the U.S. declined by about a penny in many regions, although for most drivers, prices were fairly flat, week over week. The price of a gallon of diesel, nationally, fell from $3.88 last week to $3.87 this week. For drivers nationwide, gas prices remain above their November 11 low, when the nationwide average had fallen to about $3.19 per gallon. In many regions, the price was well below $3.00, with the Gulf Coast enjoying the lowest prices of all regions, at $2.98. However, prices began ticking upward the following week, only to surge over the Thanksgiving holiday and in the days afterward. The volatility in prices came from a number of sources, from geopolitical conflicts in Africa and the Middle East, to refinery issues in the United States. 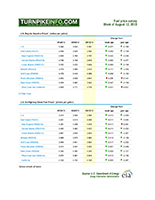 Futures prices jumped dramatically the week following Thanksgiving. The price of West Texas Intermediate has slipped from its high on December 10, when prices reached $98.67 per barrel, for January delivery. The WTI remained above $97 per barrel on Tuesday afternoon, and prices are well above their low of $92.36, on November 27. Brent Light Sweet Crude, meanwhile, remains near $110 per barrel, having come off its early-December peak of $112.24, the highest it had been in 18 months. Brent, as a benchmark commodity, peaked about one week before dragging the WTI with it, in a speculative upturn driven by the lingering political instability in Libya and a dramatic decline in crude inventories at the start of the month. The cost of a gallon of gas continued its unrelenting march to $4.00 per gallon this week as the average cost for a gallon of regular unleaded fuel reached $3.75, up an average of 11¢ per gallon for each of the past two weeks. The price of a gallon of gas has gone up about 50¢ since Christmas Day, less than two months ago, making the average cost of a fill up about $8.00 more expensive for the average U.S. driver. The price is based on a 16-gallon tank filled from near empty. The price of fuel is detailed in this week’s survey from the Energy Information Administration, a branch of the U.S. Department of Energy. While the cost of gasoline rises, the cost of diesel fuel has also continued to go up week after week since the start of the year. The average price of a gallon of diesel fuel topped out at $4.33 per gallon, for truckers and diesel car owners driving in New England this week. For the U.S. as a whole, the cost is about $4.16 for each gallon of diesel. Are we going to see $4-per-gallon gas soon? 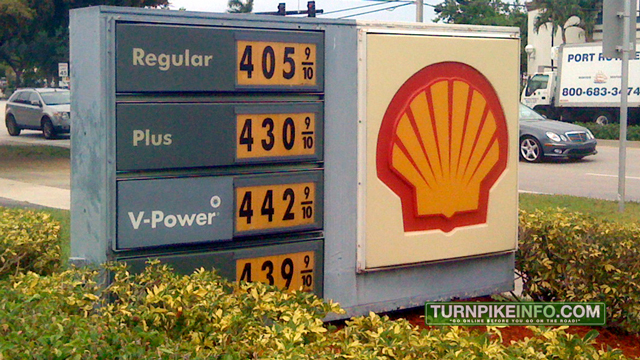 This picture, taken in May 2011 in Fort Lauderdale, shows prices at their pre-summer peak. Part of the reason for the summer-time gas costs during February can be traced to a reduction in refinery capacity. Commodities trader Dennis Gartman told CNBC Tuesday, February 19, he believed the current cost of gas was traced to what he called an “extraordinary short squeeze” caused by BP and Hess each taking down large refineries. Gartman said the reduced refining capacity pulled “almost a half a million barrels of crude oil out of the market.” BP’s refinery in Whiting, Indiana is offline for routine maintenance, but the Hess refinery in New Jersey, which was closed in January, is slated to remain offline. That could create longer-term issues for fuel supplies. The American Automobile Association reported the refinery closures are compounded by the fact crude oil, itself, is at nine-month highs, with Brent crude at over $119 per barrel. But, there is no consensus on just how high gas prices will rise or whether the current uptick in prices will continue at its current pace. Gartman told CNBC’s Fast Money he did not expect the fuel prices to keep going up; however, John Kilduff of Again Capital in New York told reporters Tuesday he would not be surprised if gas prices hit $5.00 per gallon. Gas prices across most East Coast and Midwestern states nudged upward slightly during the past week, according to the latest fuel survey by the U.S. Energy Information Agency. The average U.S. price per gallon of Regular Unleaded was at just over $3.30 per gallon, according to the January 14 survey release, up from just under $3.30 last week. Fuel prices for the East Coast and New England were much higher, however, most drivers paying about $3.45 per gallon, a full 15¢ per gallon more than the U.S. Average. Diesel prices, however, nudged down slightly, a good sign for truckers who typically spend well over $4.00 per gallon for fuel, even though diesel is well known to be much more plentiful and easier to refine than gasoline. The East Coast average for a gallon of diesel fuel was just over $4.00 per gallon, with New England states enduring the highest prices for diesel, at $4.17 per gallon.